1. Place the mince, shallot, cumin seeds and a shake of Tabasco in a bowl, and mix well together. Divide the mixture into quarters and shape into 1cm thick patties. Chill until ready to cook. 2. To make the salsa, stir together the tomatoes, chilli, red onion, coriander, olive oil, lime juice and a good shake of Tabasco. 3. Cook the burgers on a barbecue or in a griddle pan for 5 minutes on each side until thoroughly cooked through with no pink meat. 4. Meanwhile, toast the buns. 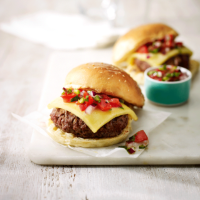 Place a burger on the base of each bun and lay a slice of cheese on each. Spoon over the salsa, pop the lids on top and serve with extra salsa on the side. A dollop of soured cream on top would add a cooling, creamy balance to the mild spice in the burgers.